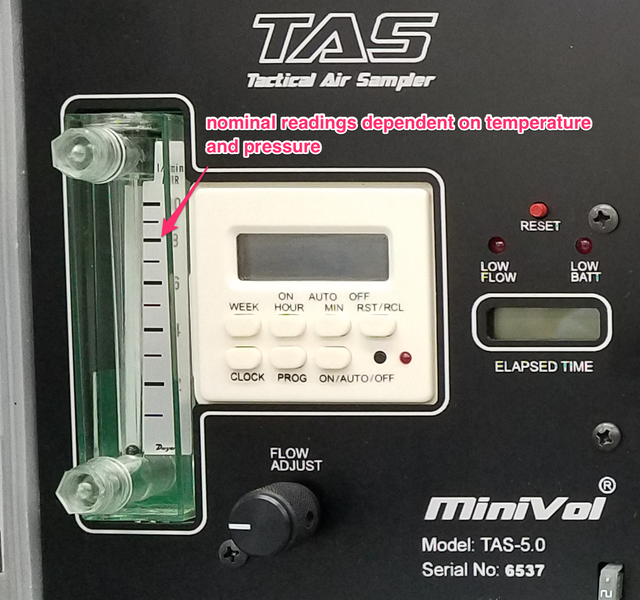 I'm trying to calibrate a MiniVol air sampler pump with a minibuck flow calibrator. Before I can do that, however, I have to check that I'm doing the calibration math correctly, and I'm having some trouble. While the spreadsheet I've prepared appears to produce numbers in the right range, the results differ from factory-provided calibration data sets. Can you help check my work? 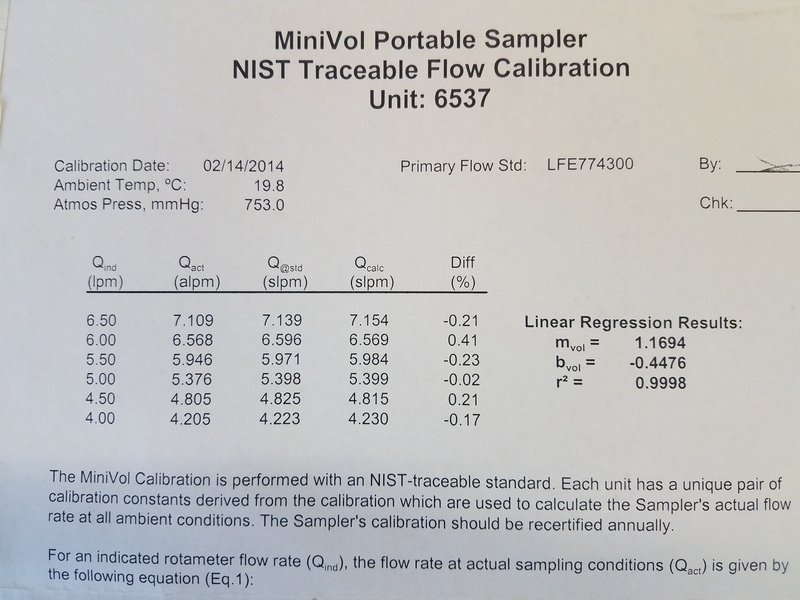 Appendix A: Calculating flow rate, on page 59 of the MiniVol Manual describes the calibration procedure. The MiniVol has a rotameter for setting and checking pump flow in the field. Its readings are only nominal, and not the 5lpm (liters per minute) that are actually needed. The rotameter needs to be set for a number that corresponds to an actual flow rate of 5lpm (liters per minute), not an indication of 5lpm To determine the actual flow rate, six measurements are taken with the flow calibration standard (in this case a MiniBuck) at six different flow rates from 4-6.5lpm as indicated on the rotameter. This is slightly unclear but I assume they mean of X,Y pairs (Qind , Qact) a least squares linear regression, which is a basic feature in LibreOffice. This statement is also unclear, but I took it to be the difference between Qact (measured) and Qcalc (calculated). The spreadsheet appears to work pretty well-- I'm getting a decent correspondence between Qcalc and Qact, BUT... the results don't match up with Airmetrics form AT ALL. None of the calculated values are the same, none of the Linear regression results match. I tried a few different checks. Again, good correspondence within my sheet, and this time a closer correspondence to Airmetrics numbers. Am I having a significant digits issue in my spreadsheet? I tried to see if somehow I was using the wrong linear regression, so I replaced my calculated linear regression with Airmetrics results. That didn't bring me any closer to Airmetrics numbers though. Can you tell what's wrong? Is it my assumptions? @gretchengehrke 1) yes, P and T are pressure and temp. There's Pstd and Pact (P standard and P actual) same for temperature. Those are the temperature at standard conditions and the temperature right now. 2) yes, it should be Qcalc, but there's no equation for Qcalc anywhere. I agree, since Qact is supposed to be an independent variable and a direct measurement, it makes no sense to have it be a calculated factor. I think the manual suffers a clarity issue in that it explains how the calibration was conducted amidst explaining how to use the calibration. Under field conditions, the Qact equation is used to calculate the "actual" flow rate based on the indicated flow rate. In the calibration procedure, the same formula (I'm assuming) is used to calculate Qcalc, while Qact is a direct measurement of flow, not a calculated number. 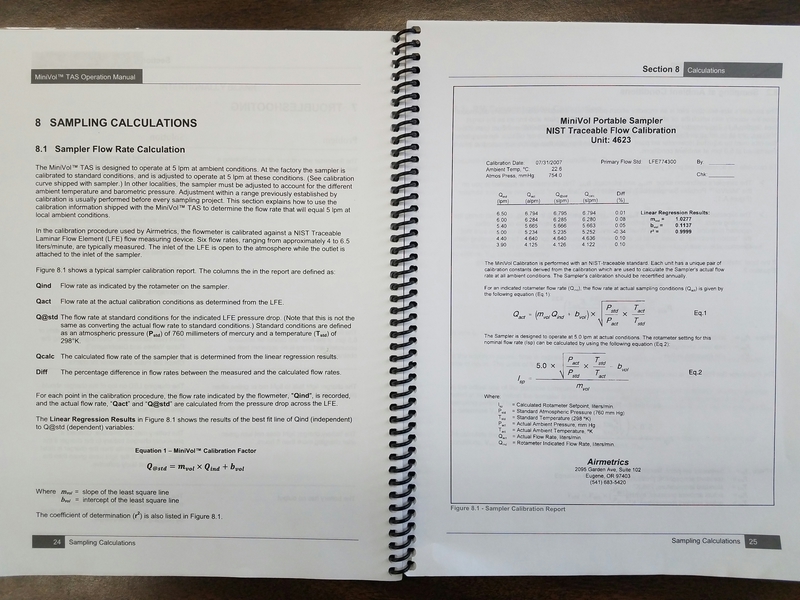 In the manual, a sample calibration chart, to be used in the field is where the Qact equation is listed, while Qcalc is explained on the opposite page as a factor used only during calibration. 3) I omitted the absolute value from the %Diff calculation because there were positive and negative percentages given in Airmetrics reference numbers. I'm not sure it makes much of a difference to display negative percentages. The numbers I got were well within the +/- 2% range that the calibration is attempting to reach, we should be fine to use this calibration system, for now. Do we have contacts who've used these instruments that we could reach out to for input on these calculations? Airmetrics got to scratching their heads over this difference as well! 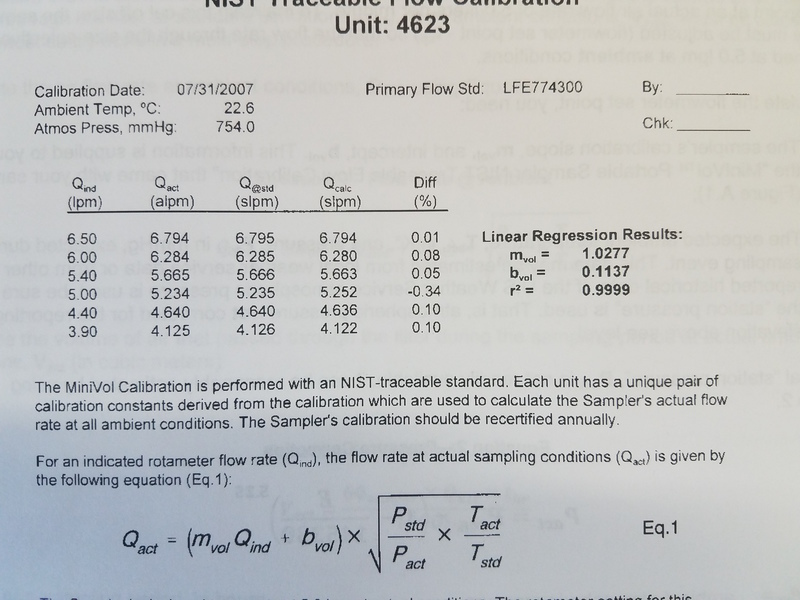 It turns out there is an additional variable that isn't listed in the manual but used to calculate Qcalc: The pressure drop across the Laminar Flow Element calibrator that Airmetrics uses for their calibration.